​If you are a magician and you want to do a mind blowing trick on stage, look no further! This trick will blow your audience away! Magicians like to use huge cards for their audience because when your on stage it would be hard to see a small standard size card. We now have giant marked cards for sale! The size of these cards are 20 cm x 28 cm (about the size of a piece of printer paper). The markings are also made huge! This is for reading cards from a good distance perfect for on stage magic card reading tricks! 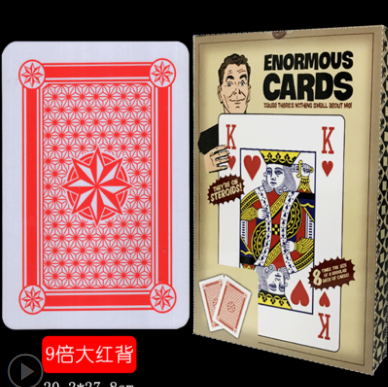 The basis of this trick is to hand out the large deck of cards to the audience. Let them pick out any card they want and raise it up. You can then tell them what their card is (because you will see the infrared markings on the back of the card)! You can also hand out every card in the deck and start telling the audience who has which card. It will blow the audience mind! Check out our options. We can sell a package deal with the giant marked cards and either infrared sunglasses or infrared contact lenses. If you already have an infrared device we can sell just the giant deck of marked cards. Free shipping!